If you have had a garden in the past, you have probably been forced to deal with an onslaught of garden pests at some point. If you’re just starting the process of cultivating a garden, then it’s never too soon to learn how to manage critters that want to dine on the results of your diligent efforts. Fortunately, there are plenty of natural ways to get rid of unwanted guests in your trees, plants, herbs, vegetables, and flowers. By using plants, essential oils, and physical barriers, you can keep pests away from your beautiful garden. Some types of flowers actually help to deter some of the most common garden invaders. Nasturtiums are a colorful addition to any arrangement, and they may act as a repellent against aphids, whiteflies, and squash bugs. Marigolds can repel aphids and mosquitoes, and they add bright color to any yard or window box. Click here for a free pest control inspection for Arizona residents. Another option is to install plants that actually consume bugs. Carnivorous plants, such as pitcher plants, will help you manage a wide variety of crawling and flying garden invaders (including wasps, flies, ants, and slugs). The Venus flytrap is another carnivorous plant that may aid in keeping your garden pest problems minimal. While they may not eat the bugs directly, there is a natural solution to reduce the mosquito population in your backyard. ‘While there are a number of plants that keep mosquitoes away, one of the most effective plants for repelling mosquitoes is the Citrosa – not to be confused with the scented citronella geranium plant,’ says Gardening Know How. These plants are popular for the citronella oil which is common in candles and repellent sprays on the market shelves. A broad range of herbs can work to prevent or put an end to a garden invasion. If you have felines, catnip will keep them happy while also deterring certain pests (such as weevils, ants, and aphids) from destroying your plants. Garlic repels snails, coddling moths, and Japanese beetles. Lavender can ward off moths and fleas, and its scent is known to be relaxing. If your goal is to keep mosquitos away from your garden naturally, you might try a blend of essential oils. By mixing no more than a quarter of a teaspoon each of lemon-eucalyptus essential oil, lavender essential oil, and geranium oil in a base of almond oil, you create a safer spray that should be as effective as pest control solutions. Sometimes, the critters you wish to deter are larger than bugs. A good fence will keep neighborhood animals out of your yard and away from your plants. Lightweight netting can discourage birds from feasting on the items in your garden. You might also cover rows of plants with fabric. “The best way to deal with wasps is to minimize their numbers by deterring them from the area,” says Gardening Know How. They suggest keeping the garden free of fallen or decaying fruit; wasps love the sweet juices. Another fun approach to natural pest control for your garden? Backyard chickens. Grow Something Green suggests keeping these birds around the backyard to eat various insects and pests. They also highlight that these backyard chickens are also useful for eating weeds and shrubs, and producing manure that is perfect for the garden. Keeping your garden safe from pests may seem like a frustrating project. However, you can rely on several tactics that will deter invaders from ruining your plants. Many of the most effective methods involve natural components that won’t harm your family, your pets, or the environment. 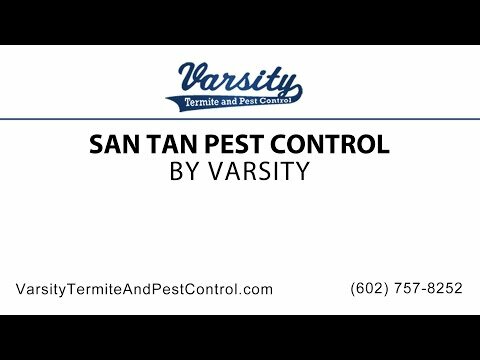 For local San Tan Valley pest control solutions, contact our team at Varsity Termite and Pest Control. WHAT PESTS ARE DANGEROUS TO MY DOGS? Read the rest of WHAT PESTS ARE DANGEROUS TO MY DOGS?